Elite athletes train their vision and visual brains to get the winning edge — and you can, too. For all ages and abilities, the exercises in 50 Tips will “tip over” the barriers holding you back to improve your sports performance. Build the 15 vision-related skills key to great performance. Learn to use the SEE IT. SAY IT. DO IT!® process to boost confidence and competitive edge. Are you responsible for marketing or fundraising for a major national nonprofit? If you need a premium to offer, this handbook is a great choice for programs such as gift-with-purchase and purchase-with-purchase. Contact us to learn how 50 Tips can help your organization knock your next promotion out of the park. Dr. Hellerstein has written an exceptional book based on techniques and exercises to enhance your athletic performance. Anyone who wants to improve their game; this book is a must read!! This small book surprised me with its unique content. The author practices optometric vision therapy for children. She has synthesized techniques for activities that improve eye-hand coordination to visualizing success. The tips are exercises – practices. Some are exercises employ physical vision, some use occupational therapy methods that are useful to almost everybody and some use success visualization such as practiced by peak performers including sports figures. The exercises are deceptively easy to do. It’s the rigor and focus that will build up the individual. The techniques will also be useful to parents that work with their children. People that perform in high-stakes situations such as athletes, musicians and teachers will find the techniques useful. I tried most by not all of them. I felt reduced stress and raised expectations for myself. I recommend this book. I was provided a promotional copy with the hope that I would give an honest review as I have. Many great strategies to enhance sports performance! Lots of very useful techniques that will apply to any and all sports. Dr. Hellerstein has written a quick and easy-to-read guide to assist athletes in developing visual skills to give them an edge in sports. These skills will benefit athletes of all levels. I found this book very easy to understand and a great resource for coaches, trainers, parents and athletes. A friend told me about this book. She suggested that it would help me with my concentration. So before I read the book and started doing the exercises, I had a hard time staying on task. I read the book and started applying the suggestions of the author and to my amazement after a few weeks all of a sudden I noticed that I’m able to stay focused and on task with out having to be distracted. I notice that my productivity is a lot higher. So I give this book a glowing 5 stars and many thanks to the doctor. Visualize Being on Top of the Podium! There are hundreds of thousands of athletes all over the world looking for a healthy, natural, and legal way to be the best at their game. Dr. Hellerstein has written an easy to read book which stresses the importance of “visual” power to gain an edge over the competition. The main theme of this short book (80 pages/large print/with illustrations) is strengthening your visual skills in order to have more control over your outcome. The first third of the book includes almost 20 vision directed exercises to give an athlete focus and coordination. The second part of the book takes the reader through the steps to mentally rehearse their skills. This is where the real “see it, say it, do it” concept comes into play. The final few pages of the book address eye health, glasses, and eye safety. I believe the cover of the book should inform the reader that the main theme of the book is concentrated visualization skills, as I thought there would be more tips on things such as the psychology, nutrition, and emotional hurdles of gaining an athletic advantage. The book is geared more toward youth athletics and beginner athletes, and would be good for coaches, P.E. teachers and parents. It is a very fast read, and I did gain a few valuable ideas to keep in mind when I train and compete. Fabulous Book For Anyone Wanting to Improve Their Game! The author, Dr. Lynn F. Hellerstein, is a Doctor of Optometry who has been a pioneer in vision therapy for over 30 years and has helped thousands of children and adults alike improve, not only their sports performance, but also their lives. In her very unique book, 50 Tips To Improve Your Sports Performance, she gives tips on how to sharpen your most dominant sense, your vision. While I have seen several books on how to improve your game, I have never read a book that was dedicated to improving your ability to play your sport through enhancing your vision. I have read some pretty informative books on natural vision, but will admit that it never occurred to me how it could affect your ability to perform on the field/court/track etc. This book was very easy to read and I enjoyed implementing the techniques to improve my vision. My daughter, who has just begun playing volleyball, will also certainly benefit from the tips in this book. Whether you are a professional or amateur athlete, one who has played for years or someone just beginning to learn, everyone can benefit and improve their game by improving their vision. This book will definitely give you the tools you need to succeed! I have never seen a kid try harder to excel at a sport as my son did when he practiced basketball. He spent hours every day practicing his shots and ball handling. I came across Dr. Hellerstein’s book and encouraged him to the techniques she suggests in her book. Now my son has a new sense of confidence and ready to take on tryouts coming next month! Thank you Dr. Hellerstein! This is a wonderful follow-up to “See It. Say It. Do It.” Many professional athletes have successfully used optometric vision therapy to enhance their performance. This easy, quick read is full of excellent tips. Thank you, Dr. Hellerstein! What if you could improve your athletic ability, mental acuity, concentration and generally enhance your performance and further your goals on and off the field? What if you could help your children do the same? Dr. Lynn Hellerstein’s new book, “50 Tips to Improve Your Sports Performance”, can help you do just that. Part of her innovative “See it. Say it. Do it! 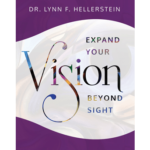 Series, Dr. Hellerstein stresses that improving your vision skills and your eye-mind-body connection can benefit just about everyone, from children just starting school or sports activities to professional athletes. In three parts–Eye-Mind-Body Coordination, Acheive the Mental Edge through the See It!. Say It! Do it! Process and Eye/Vision Safety–Dr. Hellerstein explains how 20/20 is not perfect vision, then gives one the tools for improving one’s vision and performance. Not only does Dr. Hellerstein show how to improve athletic performance, her techniques can improve schoolwork, presentation skills and strategic thinking in a business setting. This short book contains vision exercises and how-to information on visualization and focus exercises. It also contains specific visualization scripts that allow one to take the visualization concept and technique from theory to practice. I found these scripts to be essential tools for incorporating visualization into my life. Best of all, Dr. Hellerstein includes specific scripts for children ages 5-8 and 9-13 which are invaluable for parents or coaches of youth sports. There are also scripts tailored to teens and adults. The exercises are well-explained, simple and can be accomplished in short sessions. One may concentrate on a few exercises or all depending on individual need. As an example, Dr. Hellerstein includes her own action plan for successfully running a marathon at age 57, complete with lists and target dates that readers may customize for their own goals. I highly recommend “50 Tips to Improve Your Sports Performance” as a safe, legal and effective performance enhancer! I ordered this book to help my son with his balance and coordination, and have found the tips and exercises to be incredibly helpful! The book is straightforward, and the directions for practicing the tips are easy to follow. I love the focus on visualization, especially as it pertains to everything in life. This is a must buy for anyone wanting to sharpen their focus and hone their performance. Wow. I never considered training vision as well as the mind regarding sports competitiveness! We spend hours and hours practicing the physical component of any given sport, and barely give a thought to just how much training our vision (as well as our visualizations) can impact the outcome we desire. Great exercises in this little book that should have huge impact on anyone involved in sports. Practical quotes from a variety of sporting greats throughout also lend credibility and insights to those desiring improved athletic performance. As for the visualization section … this is always good stuff for anyone, whether in sports, the business world, or in creating any aspect of life. If we can’t “see” (as in visualize) our goals happening, then how the heck are we going to attain them? I think Dr. Hellerstein needs to write 50 Tips to Improve Any Performance and get it out to the greater masses. After all, we’re not all athletes, but we all need good coaching! Dr. Lynn Hellerstein, in her book “50 Tips to Improve Your Sports Performance,” has provided clear and easy to understand tips and exercises intended to help you achieve your athletic goals. There are many strengths about her book, including an easy to understand style, exercises with specific instructions, and a helpful visual layout that makes for a quick read. As a trained mental health provider, I can say with confidence that many of the recommended activities are based on research supported techniques and have been proven to enhance performance as well as improve mental health. For example, in Part Two of the book, she provides many examples of mindfulness exercises, which have been demonstrated to decrease anxiety and improve mood, concentration, and acceptance of uncomfortable physical experiences (such as chronic pain). She provides clear instructions of common relaxation techniques, including progressive muscle relaxation and breathing retraining. She also highlights the importance of practicing these skills daily so that they become automatic responses to challenging and performance-related situations. Some of my favorite tips involve increasing awareness of the present moment and not being distracted by past or future events, which is a major challenge in our daily experience! Additionally, the tips related to improving visual information processing is unique and often overlooked in sports training. If you are looking for a basic introduction to concepts and activities that can improve performance and reduce anxiety, look no further! 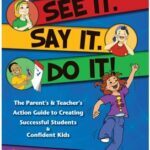 This book is filled with tips and activities to help improve visual performance. The author keeps things very simple and organized, making the book easy to read and the activities enjoyable. Most people who are trying to improve sports performance focus more on skills, whereas this book focuses on the mental and visual aspect for improvement. If you are really looking to improve this is definitely a book worth reading, especially since it doesn’t bog you down with unnecessary details! I love working out and this book is encouraging See it. Say it. Do it. Seeing what you want and what your goals are. Say it out loud. Then go out and actually do it. What I found interesting is during the “say it” section it says to say it like it has already happened. Starting with the end and moving backwards. Tricking the brain which is what any athlete does, especially when it is a difficult goal to achieve. Great strategies to help achieve the goals! love it! This is a neat little booklet. It’s small enough to put in your purse or backpack. It’s easy to follow and there are some great tips in here! I wish I would have read this book when I was riding on an equestrian drill team. I would have had more fun! I’m not big into sports at this time of life, but I do exercise and keep in shape, and I bought this book for a few tips. It is small and a very easy read. My first thought as I was leafing through it was “interesting concepts,” then I started reading some of the tips out loud to my husband. He said “oh yes, I had coaches that taught me to visualize.” And, my husband was a very good athlete! So, then I read a little closer. If you are an athlete of any kind this would be a good book to read and chew on for awhile. If you coach young people in sports you should definitely read this. I plan to gift it to a friend who coaches boy’s baseball. This is a great book! The tips are very simple but more importantly they are practical so you can put it all to use right away in whatever activity you are doing. I particularly appreciated the tips on improving your eyesight. That is one thing I never think to exercise or improve and after reading the book you realize how impossible most sport activities would be without great eyesight so why wouldn’t you exercise your eyesight. A lot of the mental tips I think would be relevant in so many situations, not just in sports so I think this book is something everyone should read, it’s short and to the point and you could walk away with advice that could push you closer to your goals, whatever they may be. The title of the book says it all. 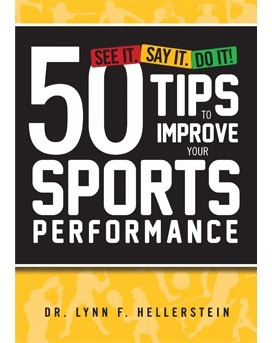 Dr. Hellerstein has written an easy to read, super useful book with 50 tips to improve your sports performance. I would recommend this book to anyone that has children that are in sports – teenagers could learn a lot from this very quick read! I just wanted to share with you how much my 13 year old son, Bryan, has enjoyed your new book. He has already read it through once on his Kindle Fire and is now working through it again and doing the exercises. We finally discovered Bryan’s need for vision therapy when he was in the 5th grade. Bryan loved to read but was struggling significantly with spelling and writing. We heard about vision therapy from Dr. Carl Myers when he was speaking on a radio program through WBCL in Ft. Wayne, IN. Bryan finished therapy during the summer of 2011. I signed up for your newsletter when we first discovered vision therapy. I didn’t tell Bryan, my sports loving football, wrestling and track athlete about your book; he just came home to it on his Kindle. He prepared for his first football game last week by doing the exercises in your book, which I didn’t know about until after the game! He had awesome plays during the game and attributes much of his success to what you taught him. “Thank You” seems so inadequate for your work in vision therapy. We are recipients of the miracle found in vision therapy and will be forever grateful.